As an organic chemist, Dee McCaffrey worked with chemicals like sodium lauryl sulfate – a detergent-like substance used to test for water pollutants – everyday. The last place she expected that chemical to be, however, was in the ingredients list of her favorite packaged food. As a chemist, McCaffrey was forced to question what effect the chemicals included in processed foods could have on the human body. As a woman who continually struggled with her weight, she began to wonder if these chemicals could be part of the problem. 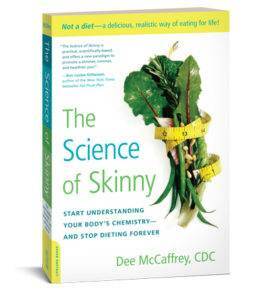 In The Science of Skinny: Start Understanding Your Body’s Chemistry – and Stop Dieting Forever, McCaffrey reveals how as the food industry continues to replace natural foods with synthetic ones, our bodies are subjected to unnatural chemical reactions which often result in major health issues – everything from obesity to arthritis. Studies conducted by food specialists related in McCaffrey’s no-nonsense prose provide compelling scientific evidence of what processed foods can do to the body in an easy-to-understand, accessible format, guaranteed to make even the most die-hard junk food lover rethink their favorite snack. Knowing how daunting it can be to drastically alter one’s diet, McCaffrey shares her own experience managing the transition, lays out a plan to help readers make the jump, and provides 50 of her own delicious, chemical-free recipes including: Over Easy Eggs Florentine, Dee’s Everyday Rainbow Salad, and Coconut Sweet Potato Brownies. After years of people telling us what we can and cannot eat, someone is finally telling us WHY. Part memoir, part expose, part lifestyle guide, The Science of Skinny provides readers with the knowledge and motivation necessary to better understand their bodies and finally stop dieting – forever. Dee McCaffrey is an organic chemist, nutrition educator, and cofounder of Processed-Free America. She lives in Tempe, Arizona with her husband.